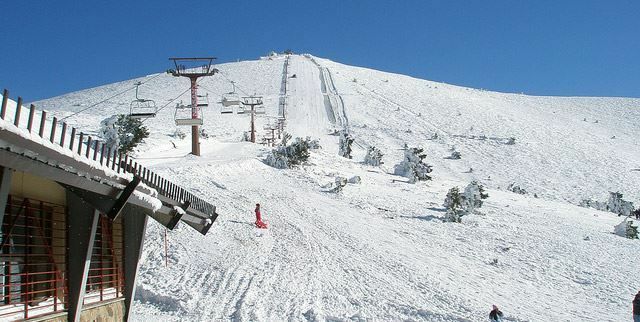 Imagine skiing in Madrid. A lot of our customers at Native Spanish Tapas are surprised when we tell them that there is a small ski resort in the north of Madrid!, skiing in Madrid is real!, and it goes by the of Puerto de Navacerrada. 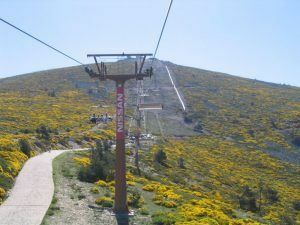 If you love skiing and are planning to come to Madrid from December till March, we would recommend doing a one day skiing in Madrid trip and then joining us for a Madrid walking tour or a Madrid tapas tour, talk about a full day! Why not, you are on holidays and you should take advantage of the time in this beautiful city that Madrid is, alongside some of the best Spanish tapas in Madrid and becoming another local at one of our authentic tapas tours in Madrid! Plus the ski resort is about 45 minutes by car. Puerto de Navacerrada is 1,858 meters high, it is quite fascinating because the top of the mountain port is where the provinces of Madrid and Segovia divide. This mountain port and ski station are quite busy and has quite a few hotels, apartments, lodges, restaurants and quite a few ski-schools. In spring and winter, Puerto de Navacerrada changes from night to day. The snow melts, the rivers begin to flow the fresh snow-water down to the different water reservoirs that Madrid has. It is a popular place for mountain biking and trekking. In fact, one of our tour guides from our Madrid tapa tours, is quite the sportsman, during the winter he snowboards and in summer he mountain bikes, all on the same ski-slope. Madrid is not only known for sun and some of the best tapas Spanish tapas out there. Madrid has all four seasons, each providing its own unforgettable moments. Do not hesitate to send us an email and we will be glad to help you out on any activities in and around Madrid. Join us for one of our many Madrid walking tours.